My rating: 8/10. 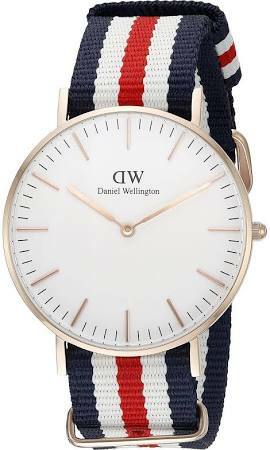 Daniel Wellington minimalist watch. Quartz powered timepiece. Hello, today I’m doing a Daniel Wellington 0502DW review. Daniel Wellington are a super popular affordable brand known for their minimalist designs. This model features a rose gold PVD casing paired up with a Nato style coloured strap. If you’re looking for affordable minimalist watches, then Daniel Wellington are a brand you should be considering. I hope you enjoy this Daniel Wellington 0502DW review below. This Daniel Wellington watch features a lovely minimalist design with a white dial detailed with rose gold PVD plated hands and hour markers. There’s no second hand on display, this is a common popular design aspect for minimalist watches. The casing is made of steel with a PVD rose gold plating to give the watch this beautiful finish. The glass lens on the front of the watch is made of mineral crystal glass. This type of glass has been specially hardened to make it extra resistant to scratches and knocks. It’s commonly found on watches in this price range. At the heart of this ladies Daniel Wellington watch is a standard quartz movement. These types of movements are popular as they’re both accurate and reliable, as well as not costing too much. The casing diameter of this Daniel Wellington Women’s watch measures 36mm in diameter and has a 6mm thickness. All in all it’s a nice slim watch which is quite standard for the Daniel Wellington brand. The strap if made of nylon fabric and has a red white and blue varied design to it. The strap is approximately 18mm wide which goes nicely with the casing diameter. This watch has a 30m water resistance rating. A 30m or 3 bar rating makes this watch suitable for everyday use. Splash/rain resistant. Not suitable for showering, bathing, swimming, snorkelling, water related work and fishing. Band: Nylon fabric strap, standard length, 18mm width, buckle style clasp. Case: Stainless steel casing, sizing diameter: 38mm and thickness: 6mm. 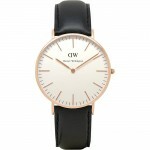 Overall, it’s another popular variation on Daniel Wellington’s selection of slim minimalist watches for men and women. Hope you enjoyed this Daniel Wellington 0502DW review. Find more watch reviews below.